The principal port of solar capture is a tall, greenhouse-like solarium that extends off the kitchen as an eating space and opens to a sunken courtyard on the south. 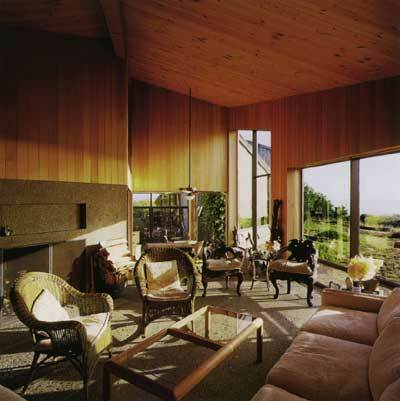 Its northern and northwestern walls, each nearly two stories high have panels that can be lowered with counter-weights to segregate the solarium as it gathers in heat, or raised to allow free movement between all the rooms of the house. Air from the solarium rises up around the chimney masses and through manipulable wall ducts to upper ventilation stacks, or is returned to the spaces below. 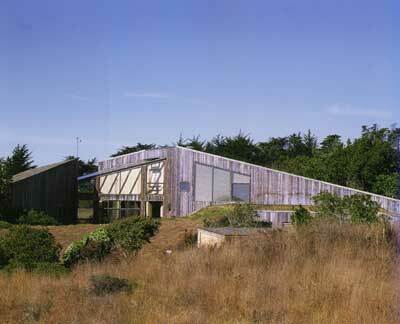 While the sea ranch house may work as a mechanism, it does not in any way feel like one. Its spaces twine around a central handsomely made concrete fireplace and chimney, anchoring the place firmly to the hearth. The mass of this center block both conceptually joins and physically separates the kitchen/eating area from the living room. Here it holds a large fireplace opening to the sitting area, while a wood stove nests in back of it on the kitchen side. Roof planes rise in three directions to this central mass, one starting over a garage sunk partially into the earth, another sloping up from the landward side to the east, and a third reaching up from the meadow on the north. 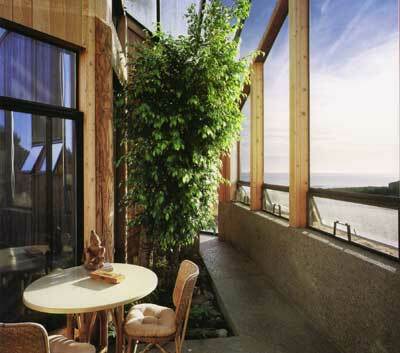 The ocean side of the house is generally glazed, with angled, projecting walls embracing the solarium and a lower, ground-hugging set of slopes covering a small bedroom wing closer to the ocean. The Halley House can be read as a modification of the site, transforming it into a mechanism for capturing climate forces and translating them into a comfortable environment for dwelling. Its roof planes, some of them covered in sod, rise up from the land in an angular array to hold great sheets of glass, oriented as much to pull in the sun as to provide exposures to the views. Its forms connect both indirectly to the changing solar cycle and directly to the earth itself. Designed for his parents, Richard and Sonya Halley, by John Halley, who founded Comet Studios (a practice concentrating on environmentally conscious planning and design), it uses energy harvested in a solarium to heat the space. Convection air moves up through interpenetrating volumes to ventilate the house, and the temperature-stabilizing mass of the ground into which it is set balances extremes. Entry to the house is from a sunken car court fronting the garage, up a stepped passage that penetrates the house between living area and garage to reach a low porch on the uphill side. This, in turn, leads to an entry at the center of the house, which opens back down into the kitchen and solarium, set slightly into the ground. To the right of the entry is a beautifully fir-paneled bookshelf wall leads out toward the glassy living room facing the meadow. 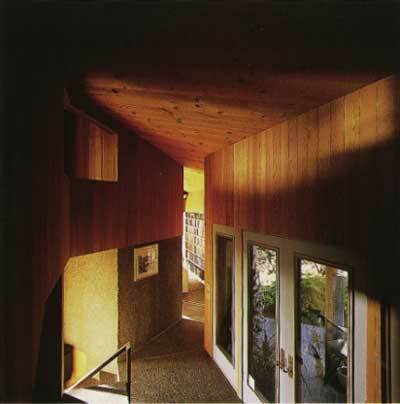 To the left, bedrooms and a secret loft above the garage are fitted within the angular geometries of the house, which allow for effective modulations in the flow of air through it, absorbing radiation from the concrete floor and walls of the solarium and transferring warmth between rooms. Light, too, moves through these spaces in mysterious ways, spreading along rich wood surfaces and reflecting back from the ground, or sliding through unexpected openings along the plane of the fir plank roof inside. The angular spaces combine with carefully formed and surfaced concrete elements of Frank Lloyd Wright’s work, though without the decorative overlay and with a studied simplicity of detail and clarity of execution that seems uncontrived and timeless. Time asserts itself mighty, though, in the exotic Chinese furnishings of the living room, inherited from Richard Halley’s family. They were given to his father by Chinese immigrants grateful for his services as a doctor in Stockton, California. Standing in intricate and somewhat convoluted splendor before the great window facing Asia, they suggest cultural refugees inhabiting this shore, sentinels of the complexity of California’s heritage. The facets, angles, and bends of the house deliberately relate to its neighbor on the west, while at the same time inducing a sense of engagement with the site – aspiraling into place that feels comfortable and secure, even as glass walls open brightly to the slopes of the meadow descending to the sea. The warm wood surfaces that embrace these spaces have been invested with precision and care by their owners, who crafted the interior surfaces themselves. The Halley House connects in many ways to its surroundings, literally, figuratively, and through association, transcending its technically informed origins.